It’s not exactly a major recycling initiative capable of slashing Formula One’s environmental impact, but at least something from Lewis Hamilton’s 2008 British Grand Prix-winning car ended up being reused. Mobil 1, the oil used by McLaren, has commissioned a portrait of the driver ‘painted’ using oil taken from the engine of the race-winning car. The artist, New Yorker David Macaluso, specialises in working using reclaimed motor oil – making him the obvious choice when Mobil 1 decided it wanted an unusual way of promoting National Oil Check Week. 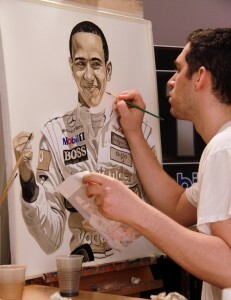 Speaking about this commission, he said: “It was exciting to do a portrait of Lewis, and it was a privilege. When people look at my portrait of Lewis Hamilton, I want them to know it contains the oil that circulated inside his Mercedes-Benz engine. History was made by Hamilton with this oil, and to experience this painting is to be eye-to-eye with that history. Hamilton, fresh from (possibly) creating art with his car and several vats of paint, was surprised to find he been driving around with the material for further creativity in his engine: “I’ve always known the choice of oil in my race car is an important component that can give us an edge over our rivals in some circumstances, but I’d never have guessed you could use it to paint with. The original painting will have its public unveiling at a VIP event for Mobil guests on the eve of this year’s British Grand Prix at Silverstone, but a limited run of 50 prints has also been produced. One of those prints can be won in a competition at mobil-1.co.uk. Categorised under Uncategorized, tagged under British Grand Prix, Lewis Hamilton, videos.